The books in the Insect Adventure Series are designed to appeal to children of ages 5-8 who are able to read alone or they can be read by parents. The stories are split into easy to read chapters and introduce children to the lives of insects and how they adapt and survive in the wild. The first book in the Series is The Voyage of the Queen Bee which tells the story of Blossom the bumblebee and her quest to save the nest after the local Hay Rattle flowers have been cut down. The exciting journey takes her far away from home on the good ship, the Queen Bee, with Captain Cricket and his first mate Phas. Will they survive their encounters with the Crab King, Salt Marsh Sirens and the Sun Ants? Buy the book to find out! 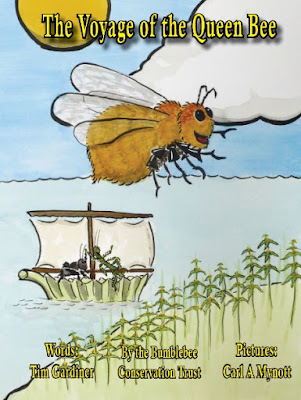 The Voyage of the Queen Bee was published by the Bumblebee Conservation Trust in November 2016 and a donation from the sale of each book goes to support their important work in conserving bumblebees. The illustrations are by Carl Mynott of British Wildlife Tales. To buy the book (£5.99 + £1.50 UK p&p) click on the PayPal link below or email me (see below).